The Irish Bank Guinness Glass Engraving - Oak Beverages Inc. 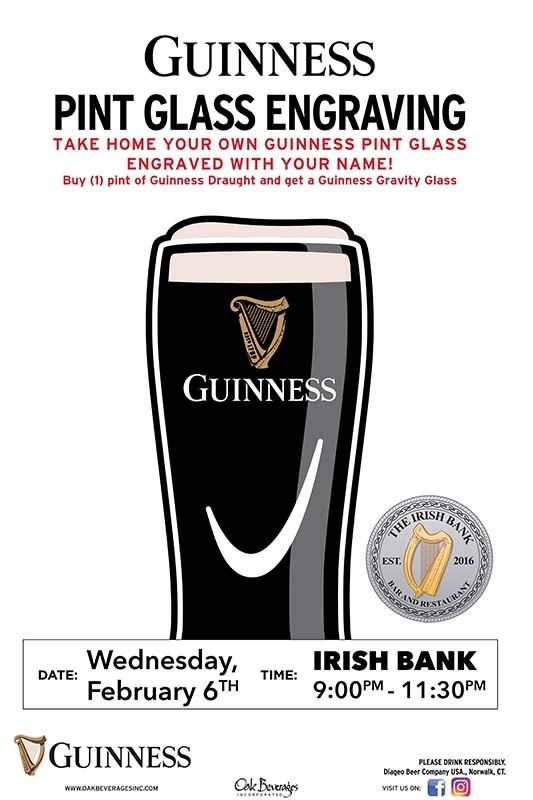 The Irish Bank Guinness Glass Engraving Event, Wednesday, February 6th, 9pm – 11:30pm. Welcome to our Irish Bar and Restaurant, with a friendly, casual, and easy atmosphere. Just drop on by! Come and join us in the center of Hartsdale, NY. We’re located across the street from the Metro North Train Station. Stop by to watch the GAA and enjoy our tradional irish breakfast with our famous pint of Guinness! Showing all live GAA games, at the irish bank we show all live games!